Whether you are updating your existing home or having us be a part of new home construction, we will be there to provide all of your tile, granite, and flooring needs. Established in 2005, we have been growing at a phenomenal rate. How? ... by providing our customers with top of the line products backed by our extensive knowledge and our commitment to the highest quality control standards in the industry. Let us be a part of your next project. We guarantee you will be completely satisfied with our products and our service. The quality and craftsmanship that we incorporate into every job both large and small are exactly the same. Not only will your family be able to enjoy our attention to detail, but if you decide to sell your home you will be able to count on the work we have done for you. Check out our galleries and the testimonials from our ever-growing satisfied customer base. You can even request a free estimate from the comfort of your own home. We can also help our do-it-yourself customers. You can be assured that we will give you as much information as we can to help your DIY project go as smoothly as possible. We have a full line of products and materials to make your project a one-stop-shopping experience. If you run into trouble just pick up the phone and we will be available with friendly advice and support. Give us a try; we are confident you won't be disappointed! Texas Tile House was established in 2005 by Rod Flowers and Yancey Traylor, two brother-in-laws of 29 years and counting. With tile installation and construction backgrounds, Rod and Yancey believed the time was right to combine their resources and take their friendship and their installation businesses to the next level. So after much thought and prayer, Texas Tile House emerged and now is flourishing, providing an avenue for Rod and Yancey to own and operate a family business. Thanks to word-of-mouth recommendations, Texas Tile House has helped thousands of homeowners add beauty and value to their homes. The installation crews of Texas Tile House are the best of the best. Their incredible skills along with their great character and integrity make them real assets to the business. The homeowners are always bragging on the installers for the excellent job they do. They show up every day with a good attitude, a smile on their faces, and they work in a clean and orderly fashion until the job is complete. What a concept! 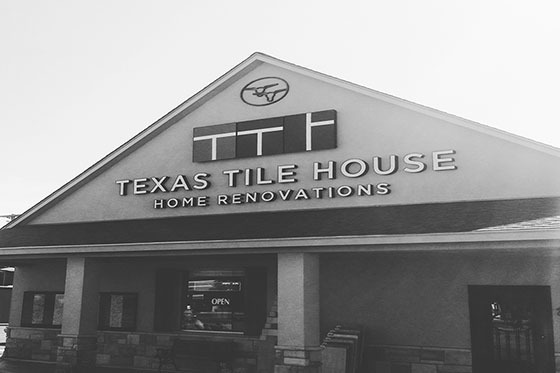 At Texas Tile House, the days are filled with interacting with homeowners, answering their questions, discussing ideas, giving helpful tips and advice, and ultimately helping them achieve their home makeovers. With their extensive knowledge, coupled with a real focus on customer service, the staff welcomes you to call the design center and set up a time to discuss your home improvement projects with them. Yancey or Rod can come out to your home to discuss ideas and options with you. They will then work up a free estimate on your project and submit it to you in an email. There is absolutely no pressure at all. They just hope to hear back from you. For brother-in-laws, Yancey Traylor and Rod Flowers, Texas Tile House was an answer to prayer; now Texas Tile House just might be an answer to yours. Texas Tile House offers an extensive line of products and services for more than just tile work. From granite countertops to shower installations to custom cabinets, we want to offer turn-key home improvement solutions. No matter what size job; large, small, or DIY projects, we will help in any way we can. You can trust our years of experience, commitment to quality craftsmanship, and the best products on the market. When it comes to our customers, we will provide the highest quality service and guarantee your complete satisfaction. Listed below are just some of the services we offer our clients.